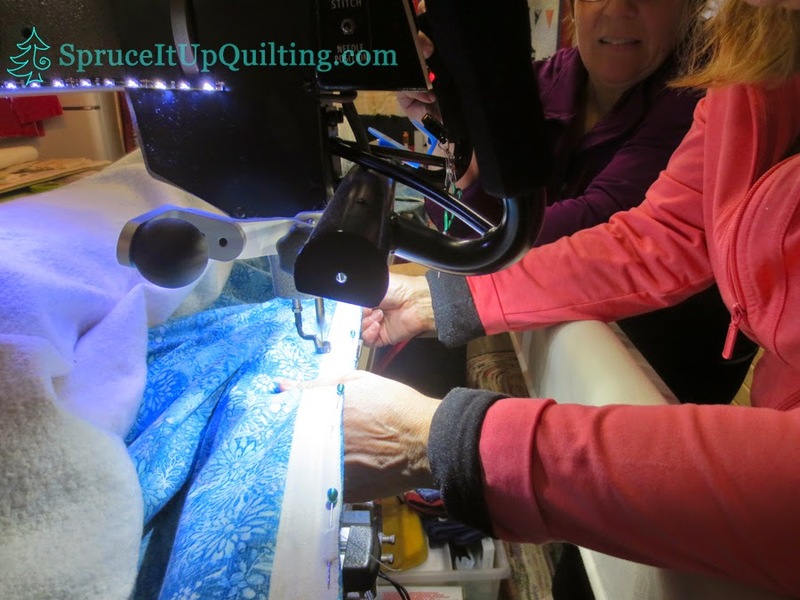 Spruce It Up Quilting: Next Day... Lise returns! 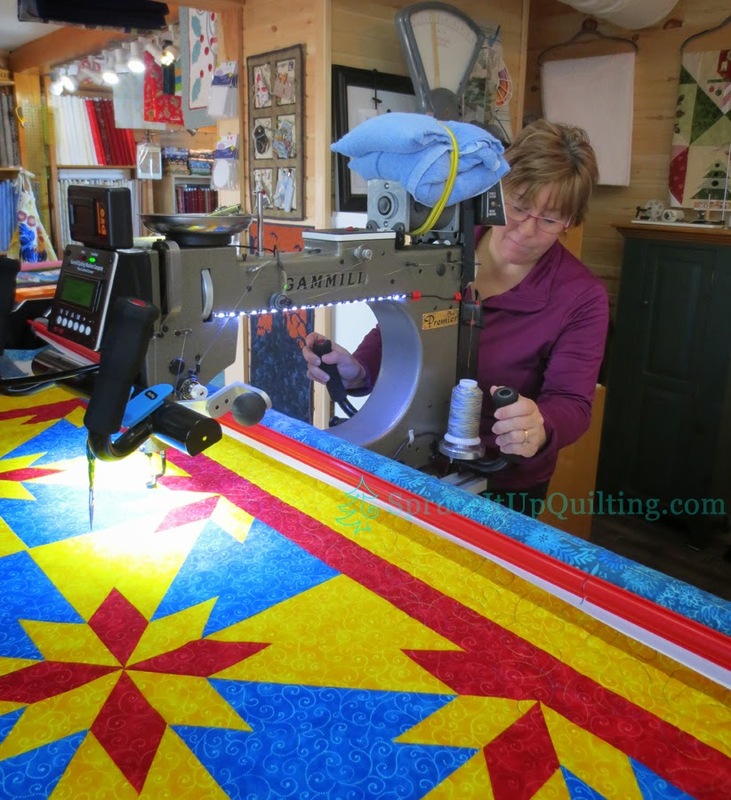 Lise returned the next day to work on her very first quilt, a Hunter Star! 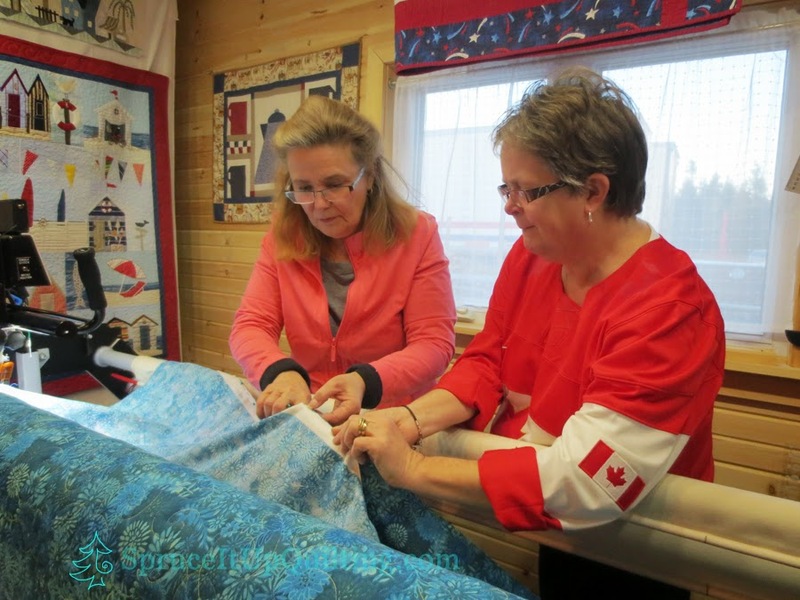 She chose this one as her first quilting experience in a class at the Fabric Cupboard taught by Patti Paddock. It's big... 90 X 110" as we will discover! 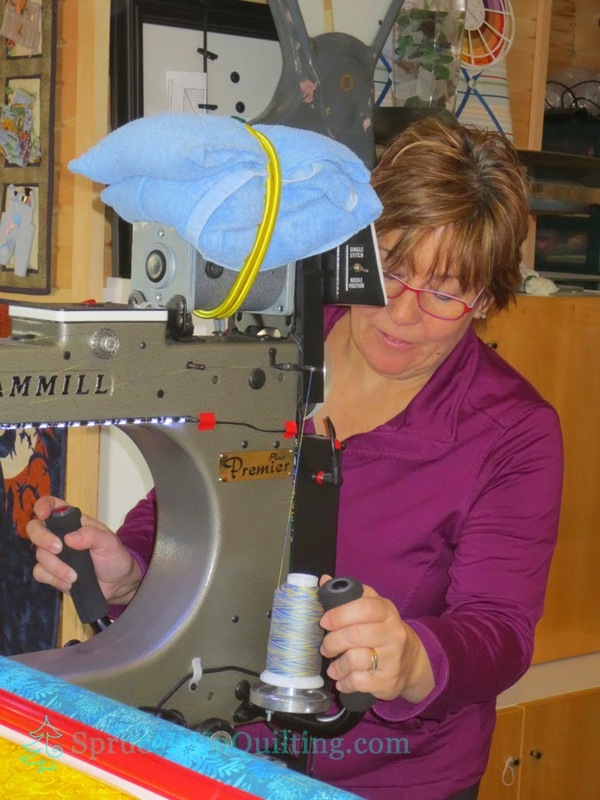 Lise chose Chantilly Lace for her pantograph, and King Tut #986 which is a blue and yellow variegated thread. The quilt was loaded vertically. 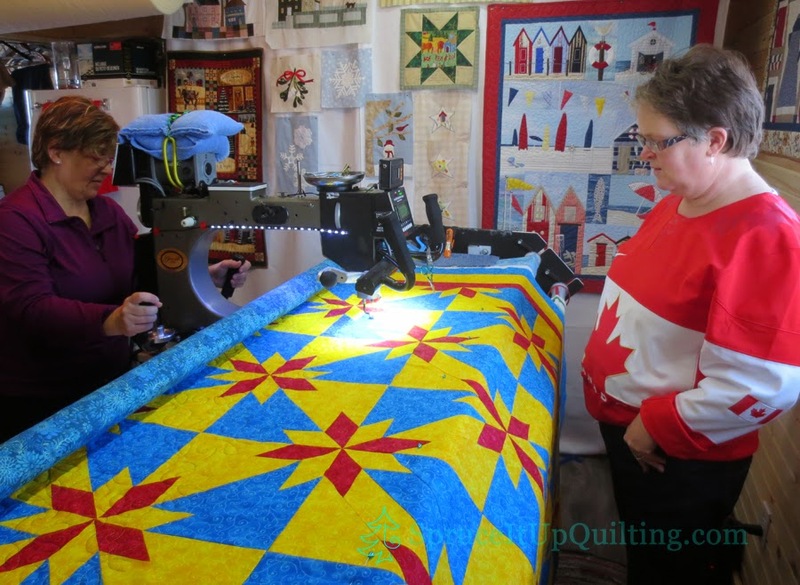 The pattern turned out to be an easy one for Lise; she has great control of Lolah and quilts at a steady speed. Lolah likes that. Hollie was on hand to help out. 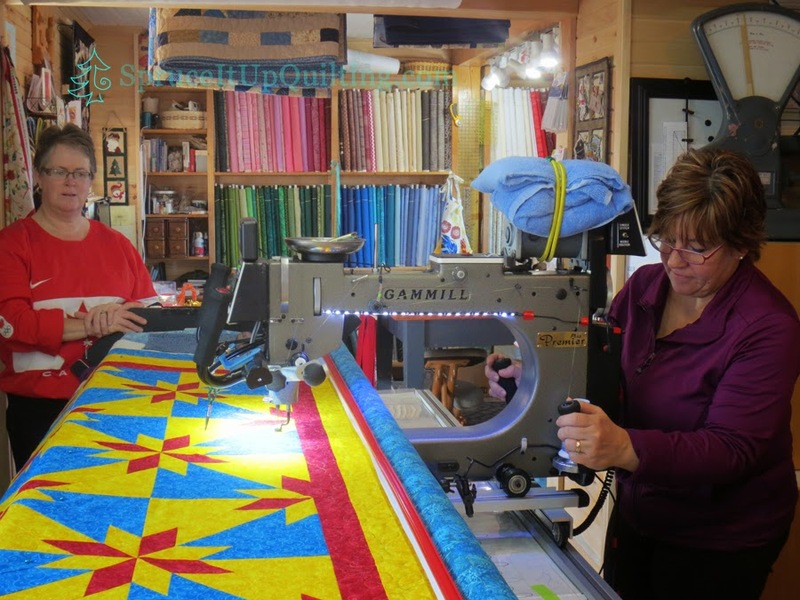 We both love to watch the progress on a quilt... We're there to "spot" throughout the day. 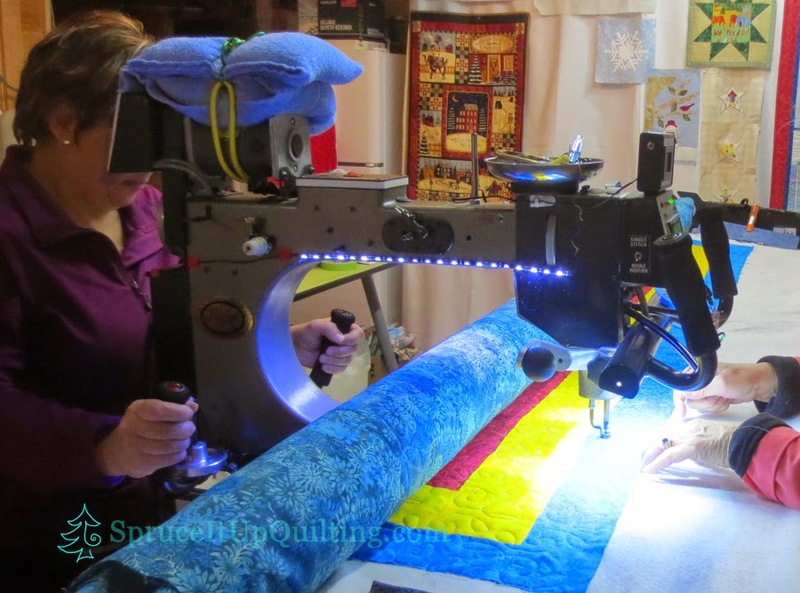 Spotting involves helping advance the quilt, monitoring the beginning and ending of the rows to make sure the fabric of the top doesn't get turned, tucked, or puckered; we watch for tension issues, both in thread and quilt layers. 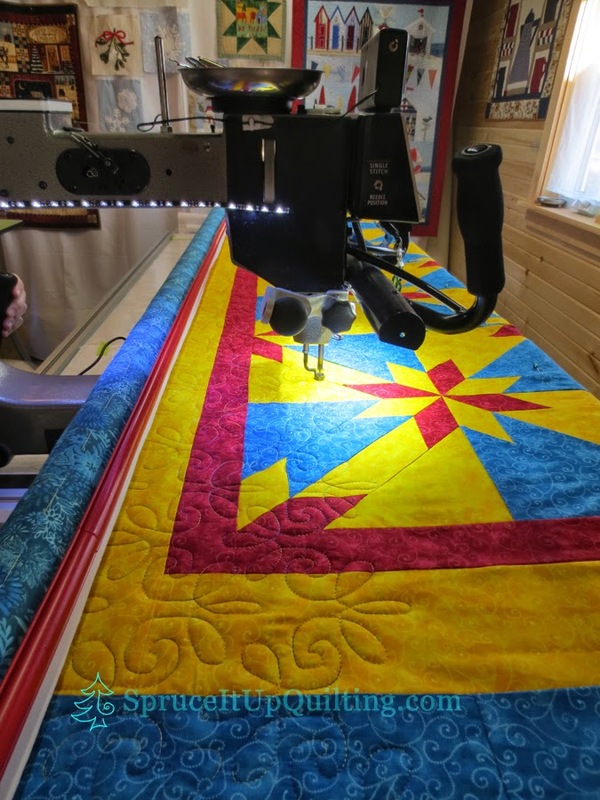 Extra fullness in certain blocks is dealt with by using what we call "can of beans" treatment where the spotter applies a little pressure on both sides of the needle. 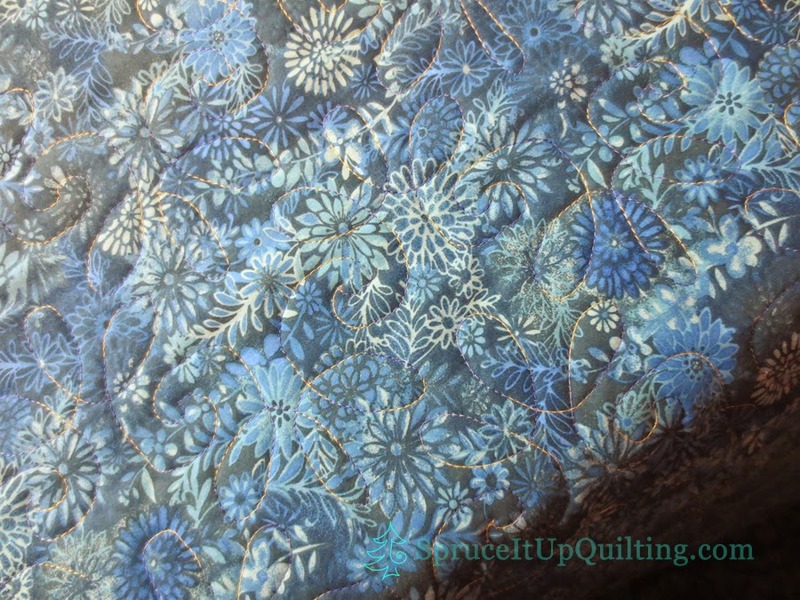 There was no need for the can of beans on this quilt; this was an accurately pieced quilt... it lay flat and square! 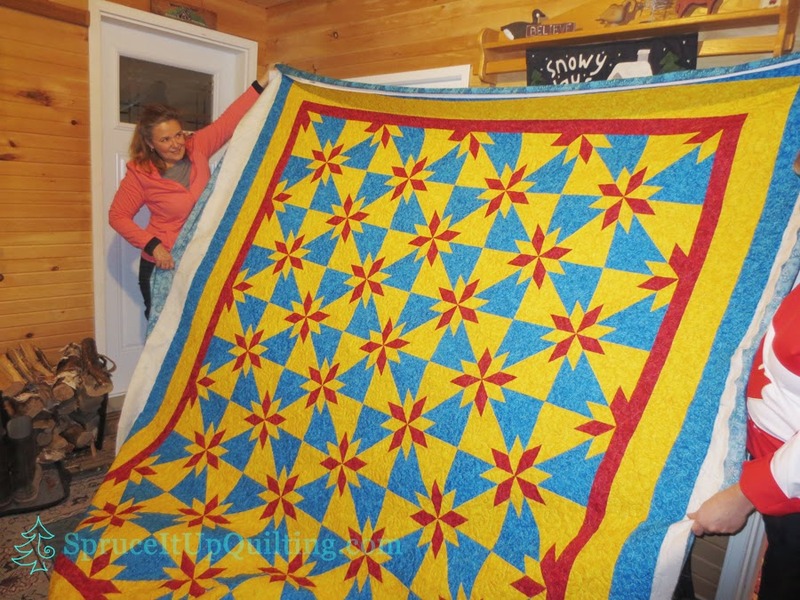 It was close to the last passes that Hollie came in from sewing on the porch and asked how big was the quilt. It was then that I realized the backing wouldn't be long enough! OH MY!!! 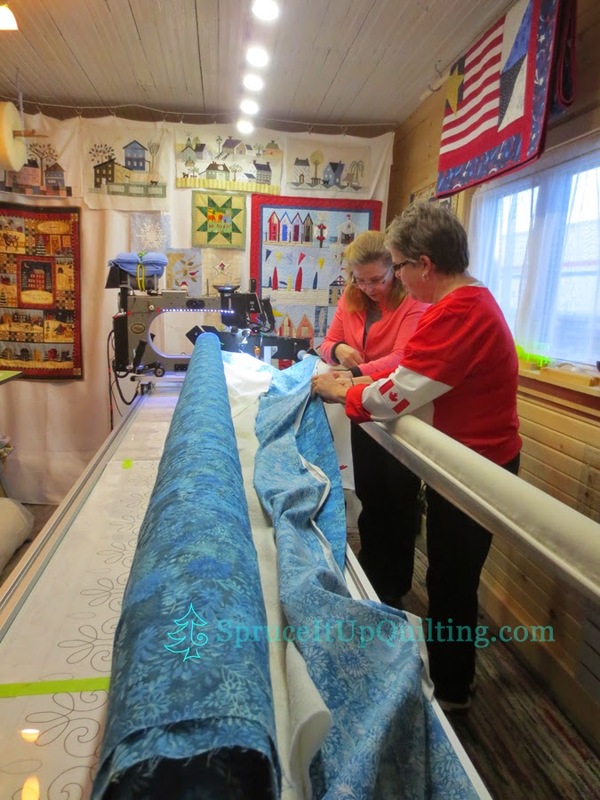 You see, Lise had purchased the backing before Christmas and we didn't measure the top when she arrived. What to do?? 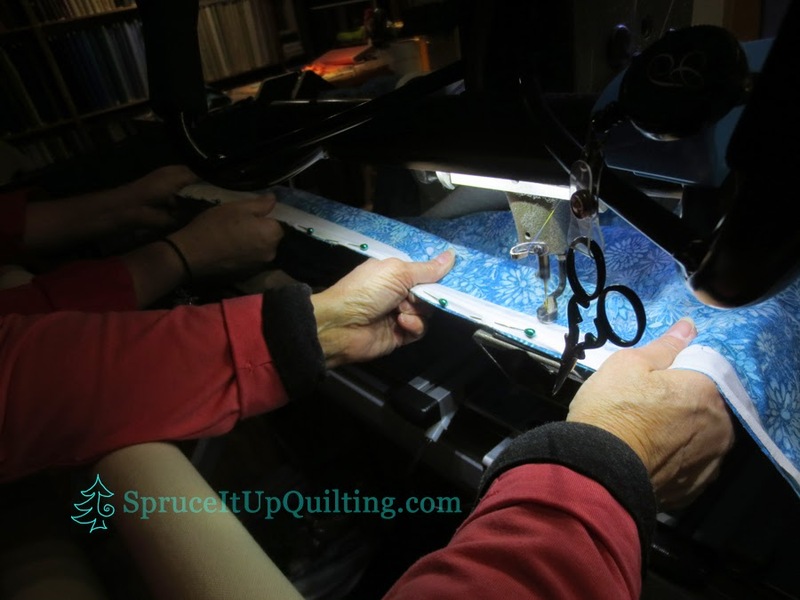 Once sewn, we trimmed off the selvage edge and reloaded. It delayed the finish by perhaps 20-30 mins. Hollie took the photos... can you tell it was during the hockey championship?? 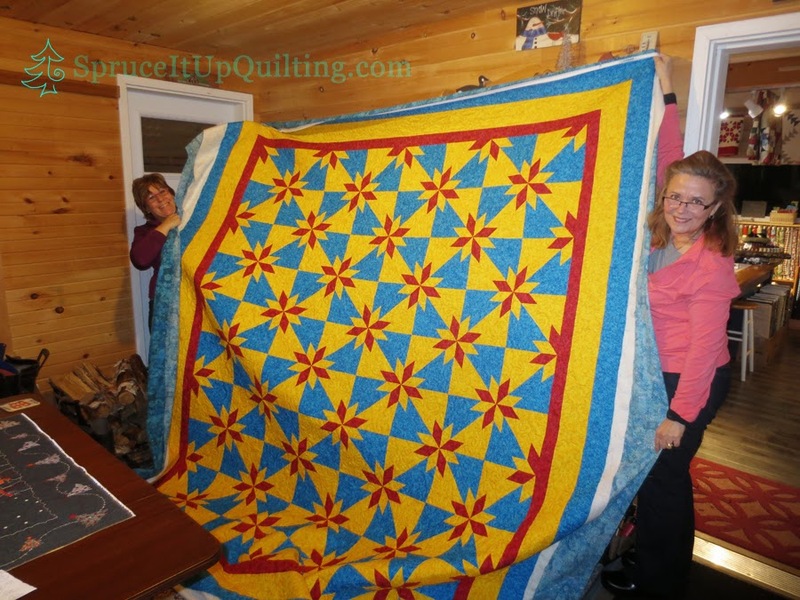 What a gorgeous quilt Lise! 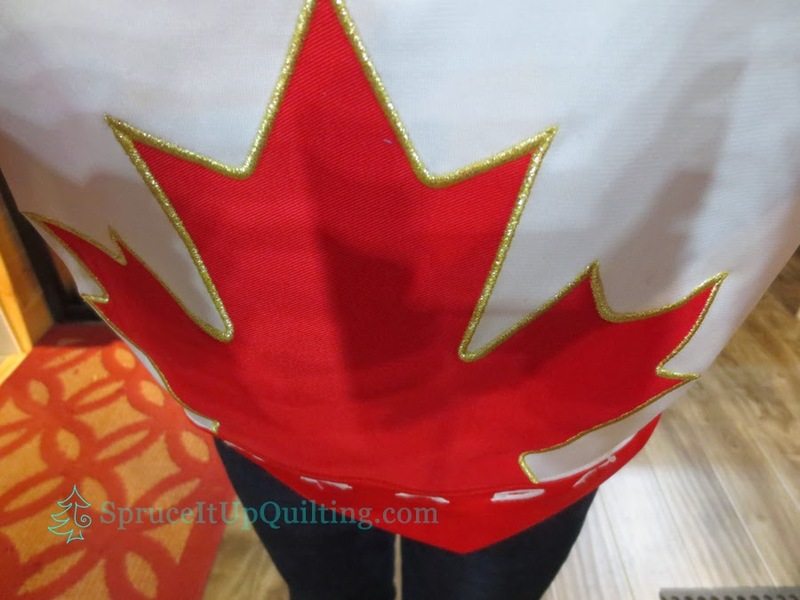 You did an amazing job quilting this beauty. 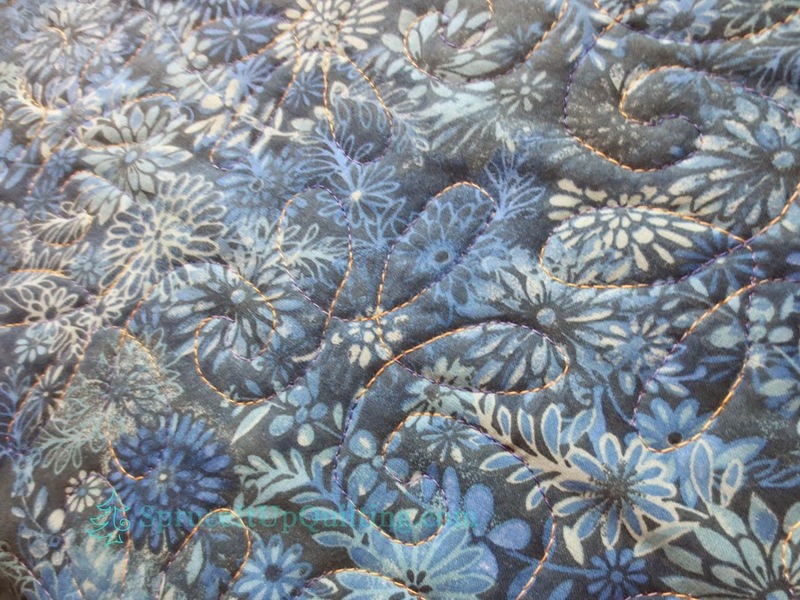 Lise has since bound the quilt and informs us that the extra backing added fit inside the binding and doesn't show! Now that was close! It's an experience we don't want to have happen but if it does, it's good to know how to do it. 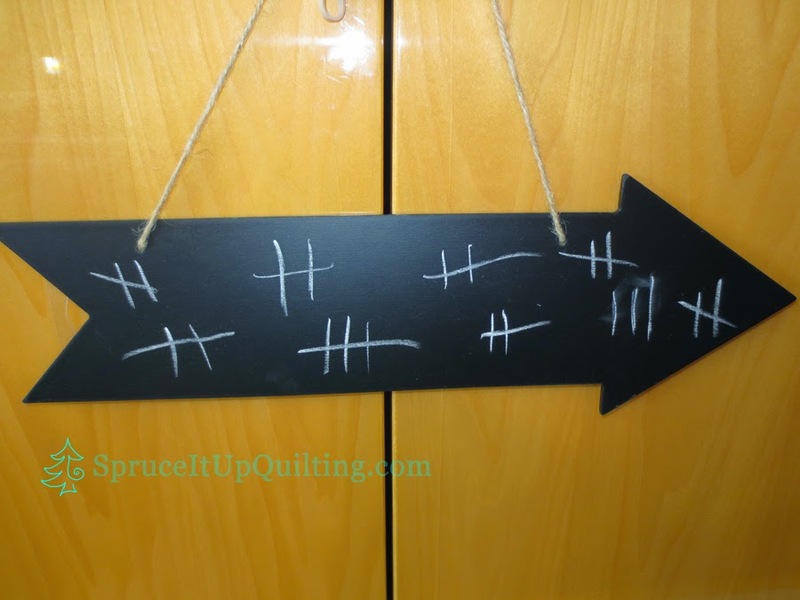 Spruce It Up Quilt Shop January Sale is over. Thank you all for your support and encouragement! It was a great week to meet new people and see some great friends. We didn't EMPTY the shelves but they are quite a bit lighter. DH has been busy emptying the van trailers and moving the contents to the barn storage. Once there's heat in the building (new thermostat installed yesterday and working!) he'll be working on some new shelves for Lolah's room. Look for some new fabrics... 64 bolts are awaiting those shelves... perhaps we'll add a few bolts here and there! 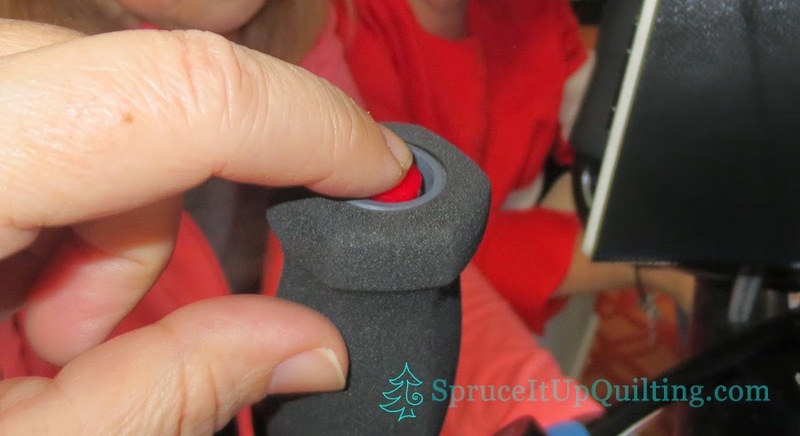 Did you notice something new on the side bar of the blog?? We have registered for the 2015 Row By Row Experience! 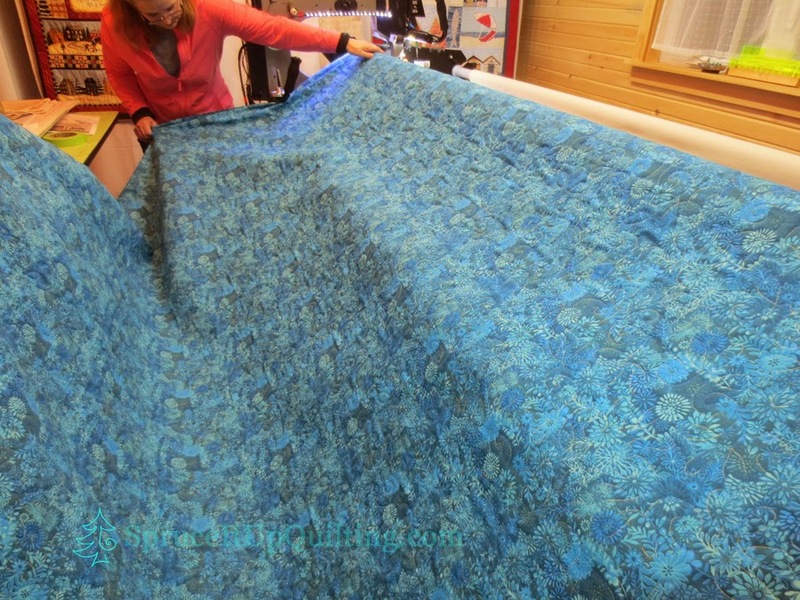 Look for more information soon as we develop our pattern and prepare the sample. And it was her first quilt!! Amazing! I saw one of your photo's on Pinterest. I was wondering what the rolled up bag/towel was on top of your machine? ?